There’s no mistaking the old No. 6 St. Louis Park jersey as belonging to Erik Rasmussen. The extra stitching in each shoulder – rips and tears patched and re-sewn time and time again -- make it distinctly Rasmussen’s, even though it could have just as easily come from Frankenstein’s closet. 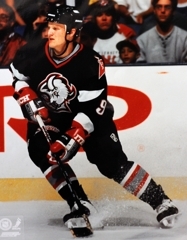 Rasmussen, indeed, was a monster on the ice. He didn’t, make that couldn’t, do anything at half speed. During Orioles conditioning drills, it wasn’t uncommon for Rasmussen to finish a full length of the ice ahead of his teammates. During games, he would “rest” not by going to the bench, but by moving from forward to defense for a couple of shifts. During confrontations in the corner, well, let’s just say Rasmussen came dangerously close to giving the term “blowing up” opposing players a literal interpretation. Rasmussen’s jersey didn’t fare much better than the players he left in a heap on the ice. 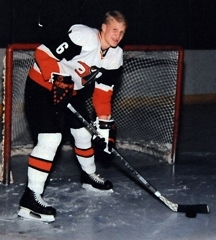 Playing on an undermanned Orioles squad routinely competing against several of the state’s most powerful programs (Edina and Bloomington Jefferson among them), the 6-foot-1, 200-pound Rasmussen did whatever was required to keep St. Louis Park competitive. If that meant he needed to play a physical style, then his jersey – and the opposition – was in for a rough night. If offense was more of a priority, then Rasmussen switched gears and concentrated more on shooting and playmaking. He went so far as to carry two sizes of shoulder pads in his equipment bag, selecting the proper piece of gear based on the type of game he anticipated playing. 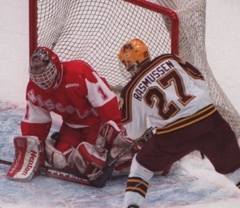 Rasmussen’s all-around ability earned him the title of Mr. Hockey in 1995. That year produced one of the finest crops of finalists for the award given annually to the state’s best senior. Others in consideration for the award included Matt Cullen of Moorhead, Mark Parrish of Bloomington Jefferson and Wyatt Smith of Warroad, each of whom went on to play at least 200 games in the NHL. A varsity regular starting when he was a freshman, Rasmussen scored 40, 43 and 52 points as a sophomore, junior and senior, respectively. 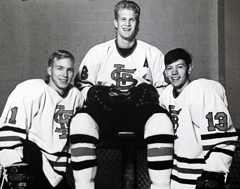 St. Louis Park advanced as far as the Section 5 semifinals just once in Rasmussen’s four seasons, and that 7-0 loss to Bloomington Jefferson came in 1992 during Rasmussen’s freshman season. “He was kind of a one-man team,” said Minnetonka coach Brian Urick, a former Skippers standout forward who played against Rasmussen. “He was a big body, a big kid. We always knew if we could stop Erik we would have a good chance of beating them. 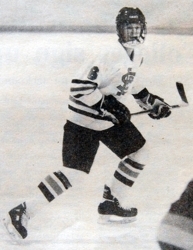 Much like in the early eras of Minnesota high school hockey, when it wasn’t uncommon for star players to skate an entire game without leaving the ice, Rasmussen rarely took a seat on the bench. “I never really thought about it,” Rasmussen said about his ironman role. “All I knew was I wanted to play. I never heard of a kid saying no to ice time. Rasmussen, who played two seasons at the University of Minnesota and 545 regular season games in the NHL, said he wouldn’t change a thing about his high school career. “I was very comfortable in St. Louis Park,” Rasmussen said. 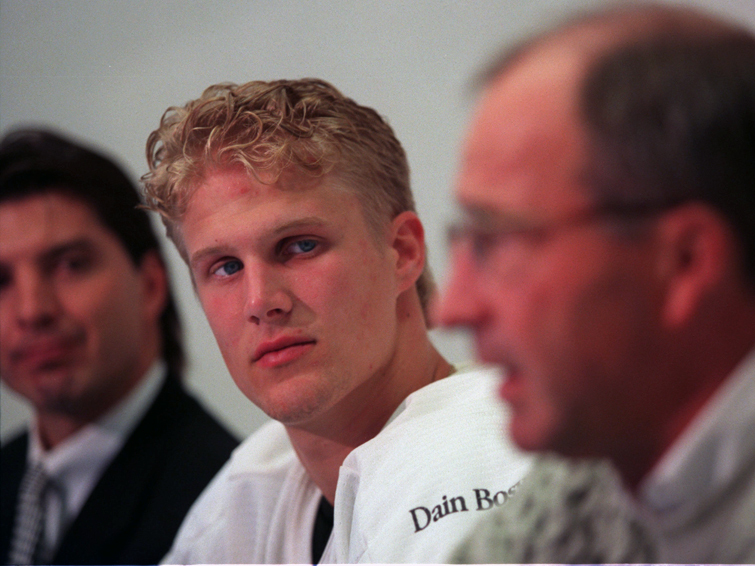 “If I wasn’t in St. Louis Park, I wouldn’t have been the player I ended up being or have had the opportunities I ended up having. 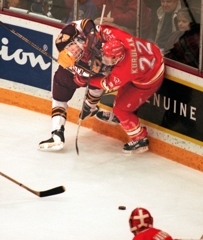 Rasmussen retired from pro hockey in 2009 and works in player development for Flexx Hockey Institute of Training. He lives in Plymouth with his wife, Kelly, and their two boys, Owen, 4, and Lukas, 6.